You can create your event tracker directly from the graphic editor. 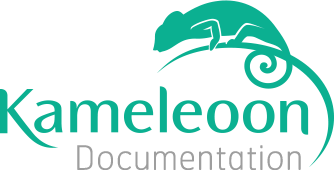 To set up a click tracking, launch Kameleoon editor on the webpage of your choice. The click tracking will appear on all variations, so the variation selected does not matter. When you have created your event tracker, you will be able to use it in any test. Select the element for which you want to track clicks. On the tool panel, the third tab "Tracking" allows you to create an event tracker. Simply type in the name you want to give to your event tracker, then click on the "Track this element" button. The tracking will be created and automatically associated with the element. You will now find it in the test finalizer. The tracking will be available for all your tests. You can associate an existing event tracker to other elements. It can be useful if, for instance, you have two "Download" buttons on the same page and you would like to track the total amount of clicks on these buttons. To do so, search the existing event trackers in the event tracker name’s field . This field allows you to name an event tracker but is also a live search bar . You can also associate several event tracker to one single element, either by creating a new event tracker or by associating an existing event tracker with the element. In our example with two "Download" buttons on the same page, we will be able to track both buttons together, but also each independently. Here, the "Download buttons" event tracker is associated to two elements (the two "Download" buttons), whereas the "Download button with logo" is only associated to one element. When an event tracker is created, you can edit it at any moment. To do son go to the "Associated to the element" where you will find the list of the event trackers associated to the selected element and place your cursor above the element you want to edit. A new pop-in will appear, allowing you to edit the event tracker settings. In this pop-in, you will be able to edit the name, and to add a description, a category or an action. In the pop-in you can see the element your event tracker is linked to. To unlink it, click on . You can also link other CSS selectors to your event tracker by clicking on « new selector ». This action will delete the event tracker permanently. You can associate it again if you want to by clicking on the "+ Add an existing event tracker" button. Lors du lancement de votre test, sélectionnez « Kameleoon » comme système de suivi. Once you have created you event tracker, you just have to select is as a goal to push the results in Kameleoon reporting tool. Before launching your test, in your test finalizer window, select "Kameleoon" as reporting tool. The list of goals created is displayed: select the event tracker you have created. Congratulations! You will now find your results in your personal space.